That's Scots Gaelic (Erse) for A Hundred-Thousand Welcomes. Don't be a stranger! 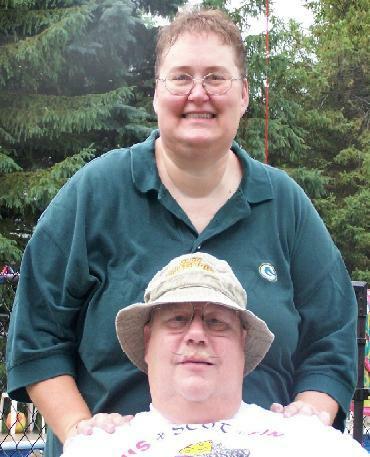 We are the Wisconsin Regents for the Clan Douglas Society of North America. Be ye a Douglas? We take in strays! Ceud Mille Failte! Feel free to post--the sky's the limit, but please...keep it clean. Ours is a family castle. Okay, so you can tell by the pictures that we have cats. LOTS of cats. Although we have five of them, only four are shown here. Our neighborhood is a prime dumping ground for cats. People buy them for their children when they're kittens, but then they get bigger or the kids lose interest or they're too much work or too expensive to maintain...blah, blah, blah. Anyway, they seem to find US. 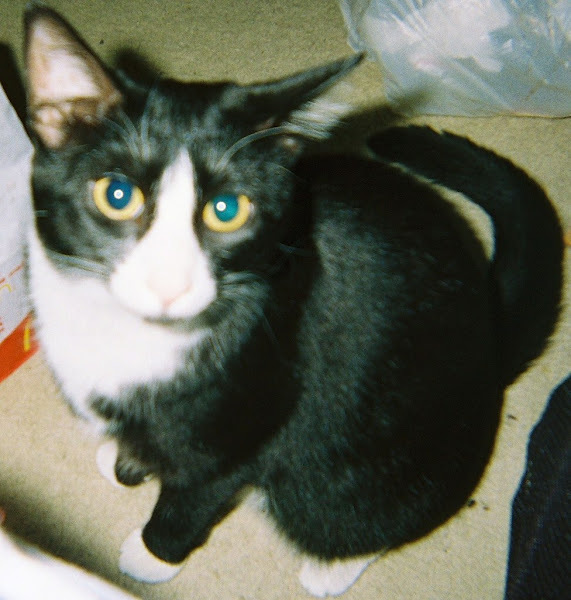 Our first rescue was a gray/black tiger we named Mischief. He was such a lover kitty! We had him five years and then he got very sick. By that time, we had collected Sass, Shadow, and P Diddle and they all knew something was wrong. Mischief, we found out, had FIV--feline immunodeficiency virus. It does to cats what HIV does to humans. We sent him to the Lord in September of 2006 before he got too painful. 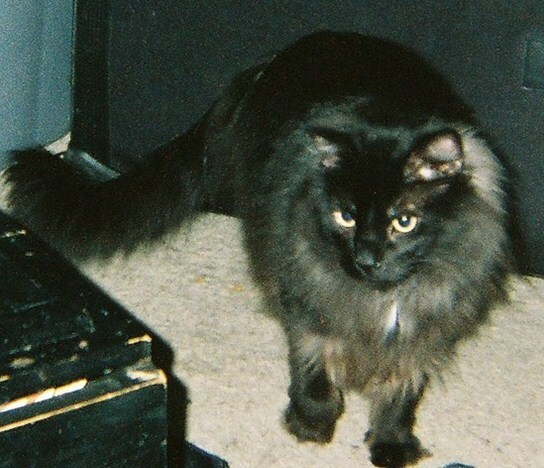 Mischief would have turned 7 on November 17, 2007. Sass, an American Shorthair, is 6 years old and came to us almost a year after Mischief. She was an older kitten who had been dumped. Our apartment manager brought her to us. After a weekend of hissing and snarling, she and Mish were buds. She's "Mommy's girl" and now rules our roost. Enter Patches, a sterile Tortie. She is a 3-year-old feral we brought in when the weather turned nasty a couple of years ago. We just didn't have the heart to leave her out there, although we'd been feeding her. She and Shadow are the best of friends and he is the only one of the cats she gets along with, and she doesn't want anything to do with humans...not even us. P Diddle (or Diddle) is a 2 1/2-year-old true Tabby (Ken says she has Siamese), and came to us from a young couple who couldn't keep her when they moved into a new apartment. 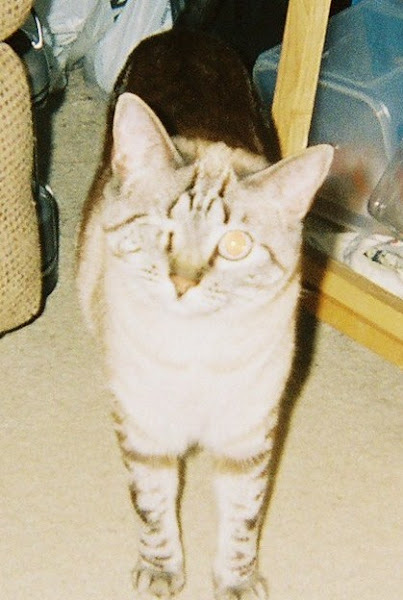 She has only one eye because when she was a very small kitten--abandoned--the young couple took her in and took her to the vet. She had a respiratory infection that traveled up her neck, into her face, and settled in her right eye. The vet removed the damaged eye and sealed the lids, except for a very small opening so that her tear duct can still function. She's pretty much "Daddy's girl" and hangs mostly by Ken. Peaches is almost 2 and no relation to Sass. Peaches is also an American Shorthair (but I detect a little Siamese in her head and face). She's an anybody's--she loves anyone who will pet her and rub her belly. 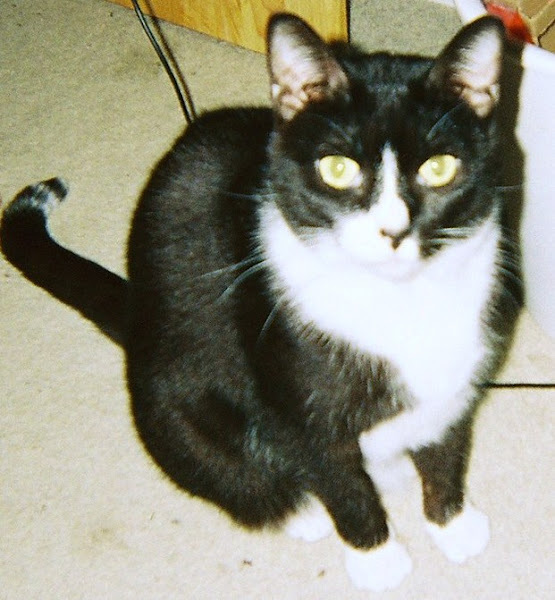 She came to us via a rider of Ken's who had to give her up because his landlord decided "no pets." She's a real go-getter and best buds with P Diddle. So that's our family. Mom, Dad, and the cats.